Here is quick shot of the Reunion quilt top all together. After I finished the top, I put the back together. This is a picture of the back from the wrong side after I spread it out flat and smooth making sure everything is straight and tight (just don't pull too tight to stretch the fabric). 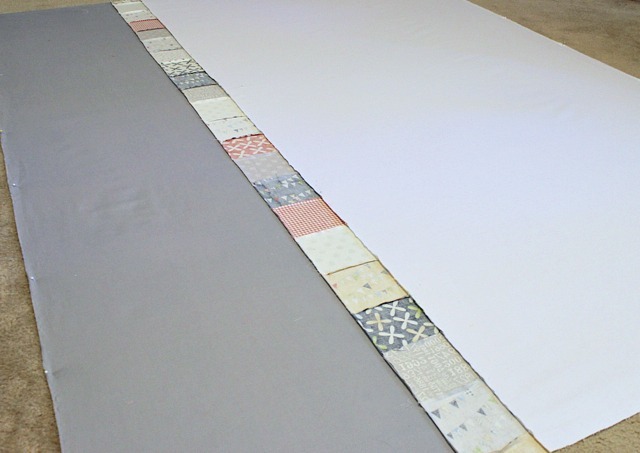 This is the first part of putting the quilt sandwich together. Once the back is spread out smoothly, I add the cotton batting (pre-soaked and dried) and the quilt top (right side up) and get to pinning. Love my Kwik Klip! I know I say that all the time, but it saves my fingers and thin nails every time. I pin starting at the center and work my way out to the edges. Stay tuned for the finished product! On a side note, are any of you going to the International Quilt Festival in Houston this weekend? This girl is and I am sooo excited!! I look forward to it every year. If you haven't been, you should add it to your to do list. It is a huge convention that is half quilt show and half shopping. If you go, bring your walking shoes! This is one of my favorite collections. I'm still hoarding two scrap bags of it for myself. I can't wait to see how you quilt this one. I definitely need to invest in a quik clip! I definitely poked the heck out of my fingers this past weekend! Asfor the Houston Quilt Festival...it's a long way from here...would love to go! I am just up to this stage of a quilt myself! My least favourite part! Your quilt is looking lovely! 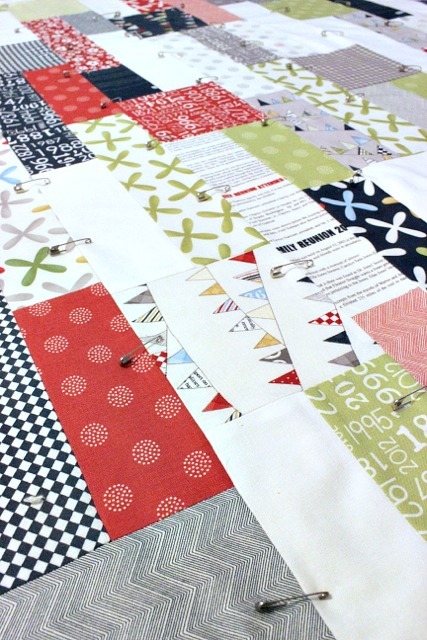 your quilt is looking great! 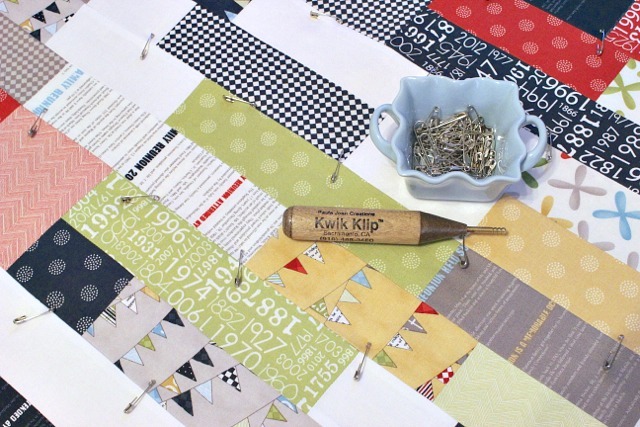 what quilting pattern have you chosen? It's turning out so pretty! Beautiful quilt and I always start pinning in the middle too. Thanks for sharing. I have a jelly roll of that fabric! It's great! Now I want to go use it of course after seeing yours done! Lovely work! I love in Houston area also. I love going to the Intl Quilt SHow every year. 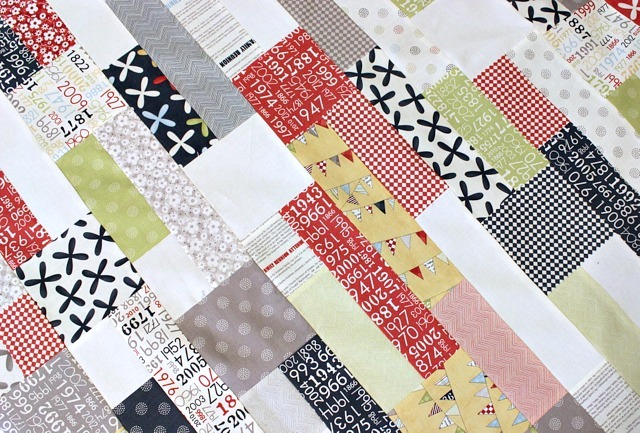 I love this quilt..looks so easy..but beautiful.